Brad Trackman is a nationally touring headliner comedian with numerous television appearances. He has appeared most recently on CBS’s The Late Late Show, CBS’s Comics Unleashed, and AXS TV’s Gotham Comedy Live. Brad started stand up in NYC,being a weekend regular at the Comedy Cellar, Gotham Comedy Club, Carolines on Broadway, Comic Strip Live, Broadway Comedy Club and Stand Up NY. Brad performs throughout the United States,Canada and parts of Europe. Brad is the co-author of the celebrity biography of shock Jock Anthony Cumia, who was part of the legendary syndicated radio show, “Opie and Anthony." 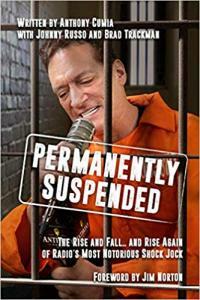 The book entitled, Permanently Suspended, made its debut as an Amazon Books #1 best seller and will be released in stores nationwide November 2018.